“White As Snow” is a long-term project that explores the opening of the Arctic Circle to commercial development through the utilization of land and water. The climate change and the ice melting redefines the importance of the Arctic cities, maps new trading sea routes while it offers opportunities for commercial development. 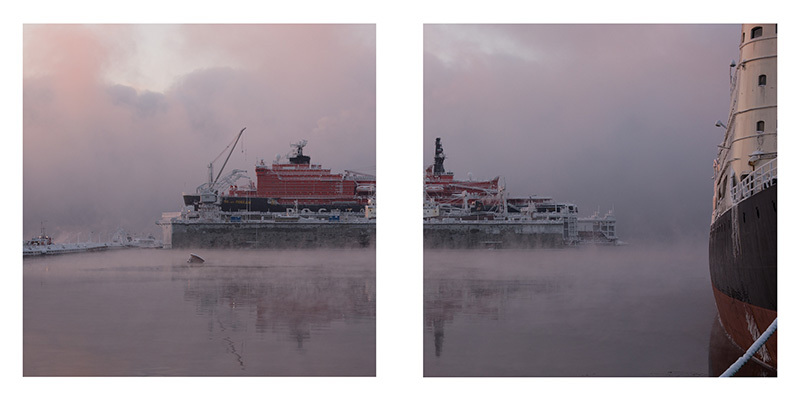 This body of work documents the landscape around Murmansk area. Murmansk is a strategic location port that ensures the geopolitical interests of Russia in the Arctic and the Northern Sea. The light of the images, which is either in dawn or dusk, connotes this ambivalent present moment of the area. The city and the surrounding area covered in snow peacefully and silently waiting with tension the next era that will assess the future of the Arctic.